Happy New Year, everyone! I realize I’m a bit late on this, but 2012 got off to a fast and furious start that left me scrambling to keep up. It’s gonna be that kinda year! Before I completely leave 2011 in the dust, I want to recap a few things that made it an awesome year. 11 things, to be exact. Because hey, it’s always good to reflect, right? Here they are, in no particular order. Celebrating my 5-year wedding anniversary. Being part of the creative team that pitched and won the PlayStation Network digital business for my agency. Seeing Jay-Z perform 99 Problems live and in person. Relaxing by the fireplace with great friends in a beautiful cabin in Big Sur. Standing under a tarp at Lollapalooza during a 30-minute monsoon. Participating in a Dark Lord vertical tasting (2008-2010). Working on my first big production shoot in LA. Watching my smartypants husband pass the CPA exam. Running onto Soldier Field for the Soldier Field 10 mile race and finishing on the 50 yard line. Being featured in Self magazine. Pretty big shoes to fill, right? But as far as 2012 goes, I’m not really big on making new year’s resolutions. Rather, I hope that the upcoming year will be better than the last. That being said, I’m taking a different approach to my blog this year. I’ve learned the hard way that my career doesn’t let me post here as often as I’d like, so in 2012 I’ll be following the quality over quantity rule. You won’t be seeing as many posts, but hopefully what you do see is better reflection of me and what I want this blog to represent. So with no further adieu, I give you my first post of 2012. 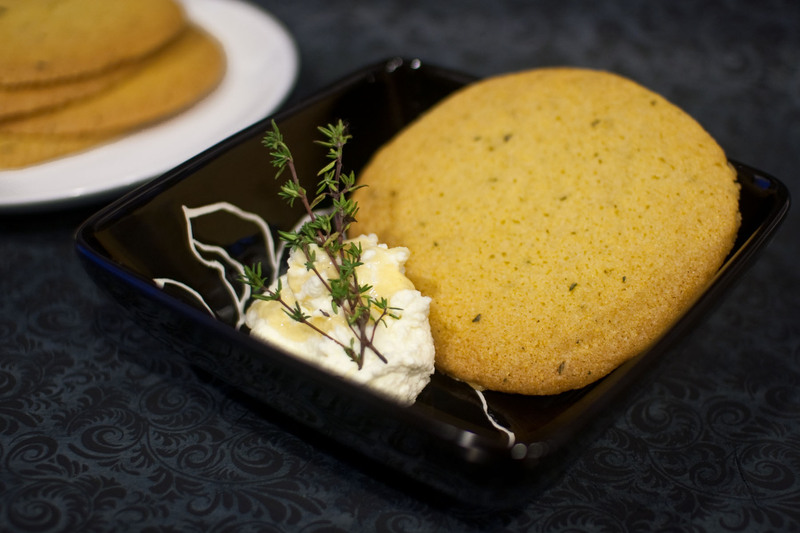 Polenta thyme cookies with ricotta and honey. I was inspired to make these cookies after having something similar at a holiday dinner. My friend Alison works at Panozzo’s, an amazing Italian market in Chicago’s South Loop, and brought a similar cookie for us to enjoy for dessert. I loved them so much that I tried my hand at making them myself. The savory flavors are so interesting in a cookie, and the cornmeal gives it a really nice texture. Serve them with a scoop of homemade ricotta drizzled with honey and you’ve got yourself a really different and delicious dessert. 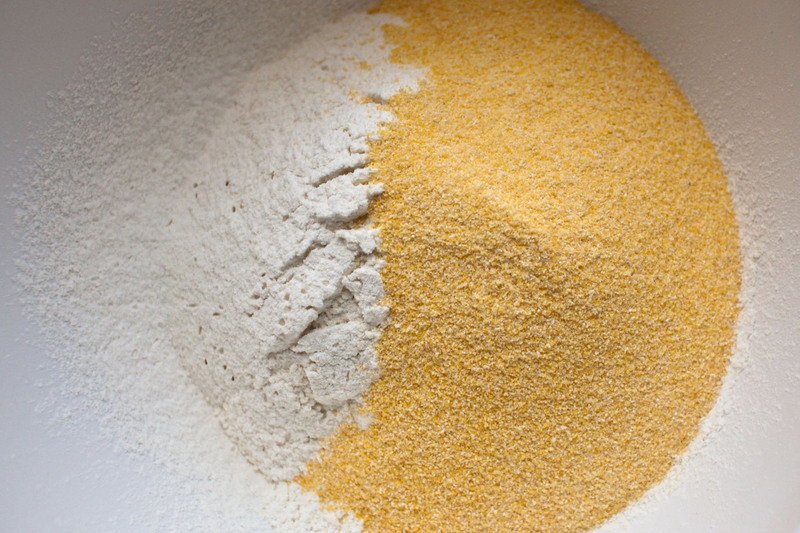 In a medium bowl, whisk together flour, baking soda, cornmeal and salt. In a large bowl, cream the butter and sugar together until light and fluffy. Mix in eggs, one at a time. Add flour mixture; mix on low speed until just combined. Mix in thyme until well incorporated. (Note: you could just scoop and drop these cookies if you wanted to as indicated in the Martha Stewart recipe linked above, but what I’ve described here is the method I used.) Place dough on a large sheet of plastic wrap, form into a log measuring about two inches around, wrap and chill for at least an hour. Once chilled, preheat oven to 350 degrees. Line three baking sheets with Silpats or parchment paper and set aside. Bake until golden, about 13 – 15 minutes. Transfer cookies to a wire rack to cool completely. Serve with homemade ricotta and a drizzle of honey. Well, it sounds like you had an extraordinary year! Congrats on all of your achievements and the best of luck to you for even more successes this year. Cheers to you, friend! Whoooaa nelly, what a year. Damn lady, you get around ;). Congratulations on a fun-filled 2011. I’m trying these cookies this Sunday. Thanks to global warming my thyme is thriving in this crazy Chicago winter weather. And a happy new year, to you! These cookies remind me of a cornmeal-lime cookie from Boston’s Flour bakery. I know it’s totally different, but the same, somehow. I’ve never made a cookie like this before and I need to. I love cornmeal! That is a great list of accomplishments. I had not heard of the 10 mile Soldier Field run before; it sounds awesome. You ought to go for a marathon in 2012! The cookies look delicious – you did Panozzo’s proud. Come visit soon for lunch. Wow, those cookies look good. A great blend between the sweet and savory! Love this! 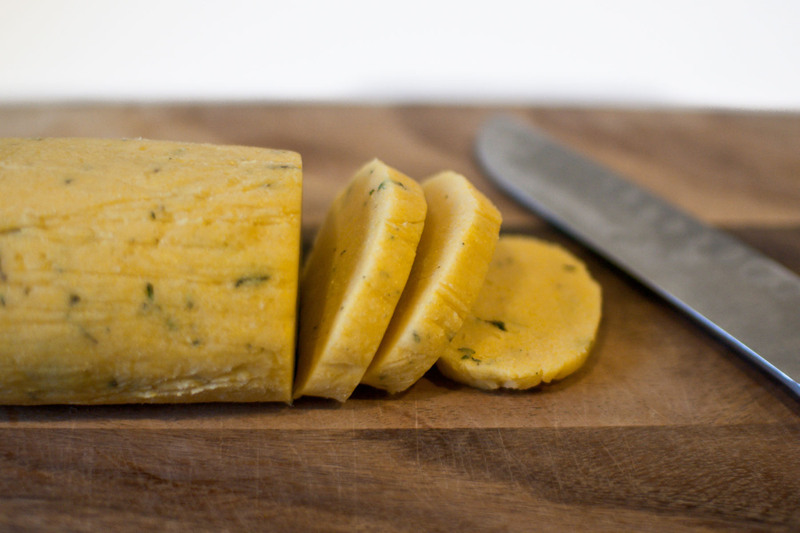 I’ve been looking for other uses for polenta besides making regular polenta. I just stumbled on your blog today. I was looking for something to bake this weekend and I just found what I was looking for. This recipe is really great. Thanks for sharing this. Thanks for coming by. I’m glad you enjoyed the cookies.